Can design engage an audience's sense of curiosity, wonder, and awe to inspire action and discovery rather than critique and competition? Problem After spending a day working with dynamic and engaged youth leaders from around the world at the U.N. during a international conference on millennium development goals, I was struck by their passiveness during a plenary session in the oppressively 1960's designed main hall. (The cafe outside being one of the few public places left in the US where smoking is permitted!) As we listened to well intentioned dignitaries and celebrities speak at length about the plight of the poor and oppressed, it became clear that this method of connection with the youth leaders was failing. Not one word was unimportant, but in the age of instant media, neither the words, the space, the seating arrangement or the technology allowed these fantastic young people to get involved, to take action, to interact, or to follow up. They looked hangdog and tired, where they had been full of life and energy during our workgroup sessions. From this feeling and observation, Fractor was born. Solution Fractor was a web application that aggregated news and nonprofit needs side by side. Combining 'Facts' (daily news stories) and 'Acts' (news related needs of non-profit/humanitarian organizations) on a single, intuitive page, Fractor aimed to provide users with a new level of news interactivity. As they followed their favorite news stories and issues, users could clearly see how they could make a positive impact in their local communities and across the globe. Iteration With Causelift, Fractor was reduced to its essence - a 'Take Action' button that could be placed near any news article on the web and would offer relevant donations users could make instantaneously. What As the world spiraled into the second of two Iraq wars, my peers and I cofounded Musicians' Alliance for Peace. Why MAP was dedicated to the creation of a local and world community where compassion, empathy and diversity were the norm and where peace was cultivated both as a means and an end. MAP celebrated a culture of universal responsibility and was inspired by musicians and music lovers around the world that united to support peace. How While MAP was effective in local action, The Music for Peace Project, one of our later projects, went global. By creating an interactive map, participants could keep up on concerts going on around the world, offer support and advise and share the global connection with their audience. Outcome During its 4 years of existence, MAP become a global organization with strong local roots that coordinated over three hundred and fifty concerts in 26 countries as well as numerous local festivals and events. Ardesco was a multimedia performance ensemble that highlighted the emotional narrative inherent in concert programs, integrating the arts while advocating living composer-performers and their music. The Arcades Project was a live improvisation ensemble at Stony Brook University that created a series of new media infused abstract expressionist pieces with both tonal and atonal elements. Andy Papadeas was the young computing guru constantly designing new sounds and coding. Nilufer Ovalioglu was our brilliant visual imagist, who made music with video, free style painting and visual design. 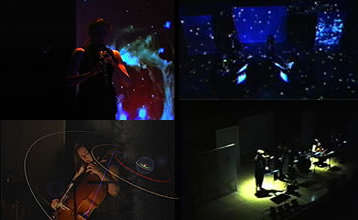 Other works produced for the Arcades Project included a piano controlled light installation, a four-voice fugue written for violin, recorded violin and dancer and multi-channel video mixer, not unlike a digital audio workstation, but specifically designed to allow live painting and video to be rhythmically mixed by visual artists in improvisatory settings.